This figure shows the two associated C-DOMAINs of a gamma-delta T cell receptor gamma chain (PDB: 1hxm_B), delta chain (PDB: 1hxm_A). The two C-DOMAINs, C-GAMMA and C-DELTA are part of the TRG C-REGION and TRD C-REGION, respectively. Only the C-DOMAINs are displayed. The carbohydrates are not shown. 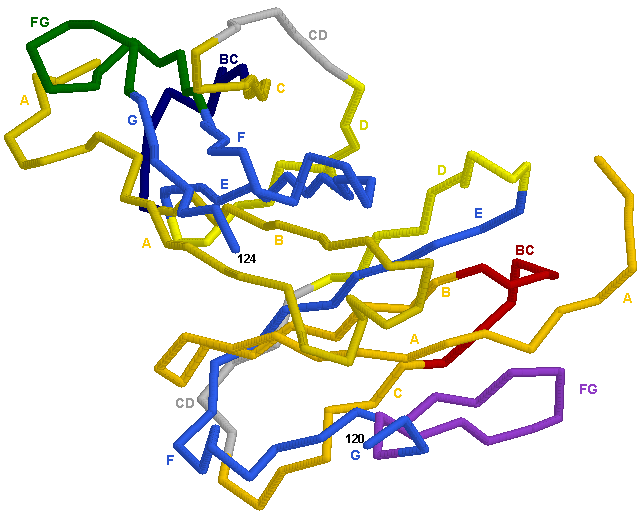 In the PDB file, the sequences include 10 and 17 amino acids of the CONNECTING-REGION of the gamma and delta chains, respectively, however, the 3D structures only include amino acids up to positions 124 and 120, for the gamma and delta C-DOMAINs, respectively, according to the IMGT unique numbering for C-DOMAIN. This image has been generated with the program RASMOL version 2.6  from the PDB file 1hxm , containing the atomic coordinates of the crystal structure of a human Vgamma9/Vdelta2 T cell receptor. Allison, T.J. et al., Nature, 411, 820-824 (2001).